"The I.D. 2000 is the strongest and safest folding knife for it's size and weight that I have ever encountered." science & weapons design and did many knife reviews ! Carbon fiber flipknives weigh only 2.7 oz ( 77 gram ). See this Tactical Knives Magazine review and the Blade Magazine Award here - Flip Knife Reviews. 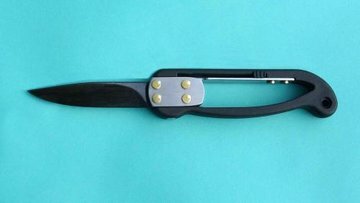 I wanted to make a new modern knife tool for the 21st Century and designed and patented these flipknives in 1998 Had 1,000 of them made in the UK in 2000. That year I participated at the Blade Magazine Knife Show held in Atlanta USA and won "Most Innovative imported Knife of the year award 2000." I have a limited quantity left. I.D. flip knives can be used with the blade open at 90 degrees to the handle allowing a variety of tasks to be performed.The blade can be twisted for jobs such as drilling holes and splitting thin wood and bones, opening coconuts and shellfish, prising lids etc. There are limits to this use and you could bend the blade if you use excessive force. The bolsters on the flipknife can be used to deliver a hammer blow to crack nuts, shellfish, bones, glass, heads. The blade gives a excellent spark when fire lighting with a magnesium stick. Imagical Design flip knives are open plan and simple in construction and have no small moving parts that could seize or jam as a result of sand or grit getting into the mechanism, consequently these are very reliable, extremely easy to keep clean and will not let you down in the field. Regular folding knives can only be cleaned when in the open position (and everyone knows how difficult it is to get sand out of the mechanism inside a handle) I.D. 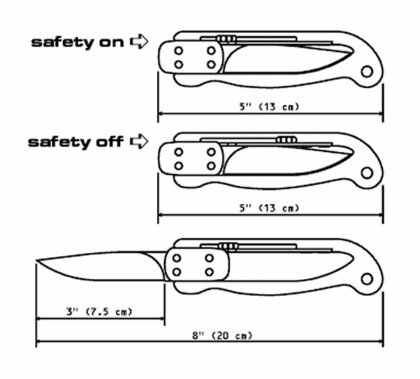 flip knives can be cleaned inside and out while the knife is still closed, a feature that greatly improves safety. 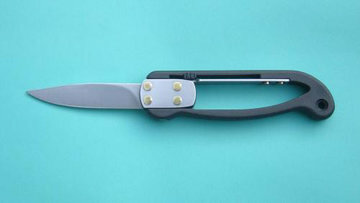 The unique patented locking system provides an absolutely solid lock when the blade is in the closed and open positions. Due to its design the locking leg can be easily operated by one finger while being held in one hand. This is because stress during use is horizontal on the locking leg i.e. across its width; but to disengage, the locking leg is bent vertically along its length. The lock is so efficient it makes the flip knife feel like a fixed bladed knife ! The handles are made from almost indestructible Carbon Fibre Composite or Zytel. They are light strong and warm to hold, sculptured to fit the hand and are very comfortable to hold in all positions, the outsides being textured for a secure grip. 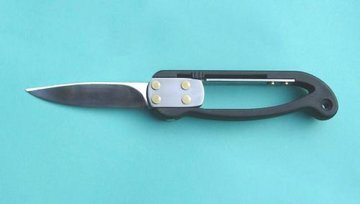 There are no sharp edges that will wear or catch in the pocket and unlike traditional folding knives that have a slot in the underside of the handle which could cause discomfort to the fingers during extended use, I.D. flip knives have no such slot resulting in a much more comfortable grip. A hole in the handle allows a lanyard to be fitted for extra security. We have chosen high carbon Sheffield steel because of it's superior 'edge holding' capabilities. Having a Rockwell hardness of RC58 it is far easier to sharpen than stainless steel. Furthermore it is a flexible steel that will not snap or chip easily and this is why it is used for quality swords. This made it the ideal choice for our blades and their use in the half open position. 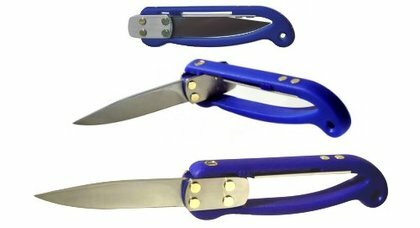 We offer gun blued blades because high carbon steel is not stainless and will discolour with use. Having the safety lock forward while the blade is closed prevents the locking bar disengaging accidentally and also makes the flip knife childproof. Putting the safety slide forward when the blade is open will prevent accidental unlocking while in use and transfer pressure from the thumb onto the pivot block making the flipknife incredibly strong. 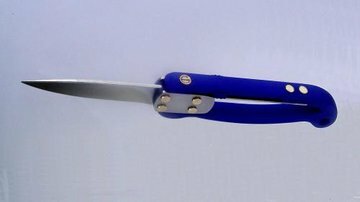 Flip knife - Blue - Satin finished blade.